The United States Food and Drug Administration, along with the Centers for Disease Control and Prevention (CDC), and state and local partners, investigated a multistate outbreak of Salmonella Concord illnesses linked to tahini imported from an Israeli manufacturer, Achdut Ltd., located in Ari’el, Israel. As of February 27, 2019, there are eight illnesses associated with tahini products from Achdut Ltd. The CDC has announced that this outbreak appears to be over. The U.S. Food and Drug Administration is alerting consumers of potential Salmonella Tennessee contamination of Soom Foods Chocolate Sweet Tahini Halva Spread. This product is individually packaged in 1 oz. (30 ML) pouches or packets with a stamped lot number of “67333D” on the bottom. The spread is packaged in purple laminated paper packets with a tear-away tab on one end. "A renewed public warning today from the FDA says a salmonella threat from certain imported tahini products is ongoing. Some of the recalled products may have label information in Hebrew only, making them difficult for many U.S. consumers to identify." "Although only five confirmed Salmonella Concord infections have been reported to federal officials, the recalled tahini products have long shelf lives with expiration dates well into 2021." "The FDA found Salmonella Concord in a sample of tahini collected at the point of import. That sample was of Baron’s brand tahini manufactured by Achdut Ltd. The FDA reported whole genome sequencing was used to determine that the Salmonella Concord in the Baron’s tahini was the outbreak strain." 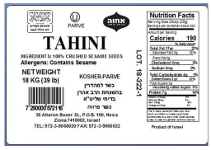 "The FDA is advising consumers not to eat recalled Achva, Achdut, Soom, S&F, and Pepperwood brand tahini and Soom brand Chocolate Sweet Tahini Halva Spread (lot code 071318CH) with expiration dates ranging from April 7, 2020 to May 21, 2020 and Baron’s brand tahini with the expiration date of May 5, 2021. The product lot codes range from 18-097 to 18-141. Consumers should discard the product or return the product to the store for a refund." Achdut LTD. of Ariel, Israel, is recalling its Tahini products of all packages and sizes produced on the following dates: April 7th to May 21st 2018, because it may be contaminated with Salmonella. The recalled "Tahini" was distributed internationally in retail stores and through mail orders. The tahini products are Tahini, Whole Tahini, Organic Tahini and Seasoned Tahini. Container sizes: 15oz, 16oz, 17.6oz, 635 oz (428g, 454g, 500g, 18Kg), with lot numbers 18-097 to 18-141 or with expiration dates April 7th to May 21st 2020, while the Baron’s brand carries an expiration date of 5/5/2021. The brand names of the products are: Achdut, Baron's, S&F, Pepperwood, Soom and Achva. Achdut is collaborating with health officials in connection with a positive finding of Salmonella in a US import sample of Achdut Tahini linked to a Salmonella outbreak that is currently being investigated by FDA and public health officials. The probable root cause for this recall is cross contamination. The company has eliminated the source of contamination and preventive steps were taken. Consumers who have purchased the Tahini above are urged to return them to the place of purchase for a full refund. Consumers with questions may contact the company at 972-3-9068020, Sun-Thu 08:00-17:00 GMT+2.